In my previous blog I quoted reports of FAO (the Food and Agriculture Organization of the United Nations) saying that farming only 60 years of farming would be left if conventional farming would continue like today. Also we quoted Shree Vasant Paranjpe stating that the soil has to be rejuvenated first by Homa Therapy, thus creating a healthy micro-flora and micro-fauna. This is the claim based on Vedic Knowledge. To which extent could this claim be validated by modern agricultural sciences? We invite you to join us in our incredible Centre of Light project, creating a global venue for spiritual ecology, Homa Therapy, creative arts, healing, sound therapy, yoga, meditation, music. Welcome! Previously we talked about the experiments on Homa Farming done at Palampur Agricultural University, Himachal Pradesh, Northern India. 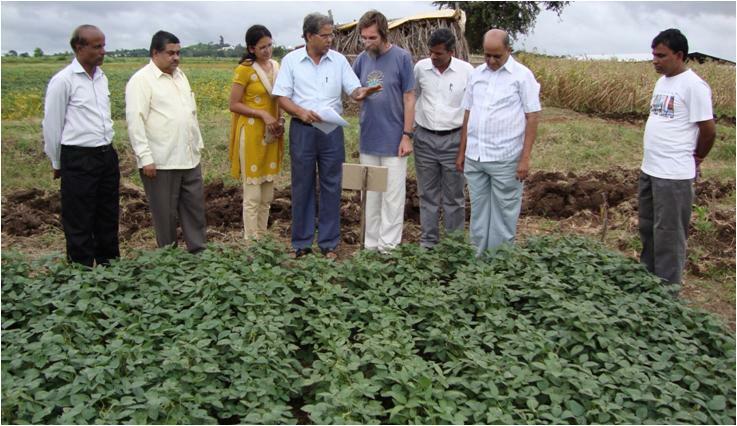 The experiments showed increased yields, better disease resistance, and better quality of the produce. The second part of their research was about soil health, a very important factor for future production. Through Dr. Ashish K Jha, Zoologist, Hislop University, (on the right side), and his student and assistant professor, Dezling Chaitanya Danta (on the left side), Homa Therapy came to Nagpur city. We had met in Indore at an International Conference, where answers to Global Climate Change and its Impacts were sought.